It’s Been a Strange Week this week at Eau Brink Studio. I have lost my diary and that has make me out of sorts. Not to mention stressed too. So what has this all meant then? I have been rather ill which has not helped the situation but I have managed to meet my obligations except for one meeting and my personal goals of exercise. 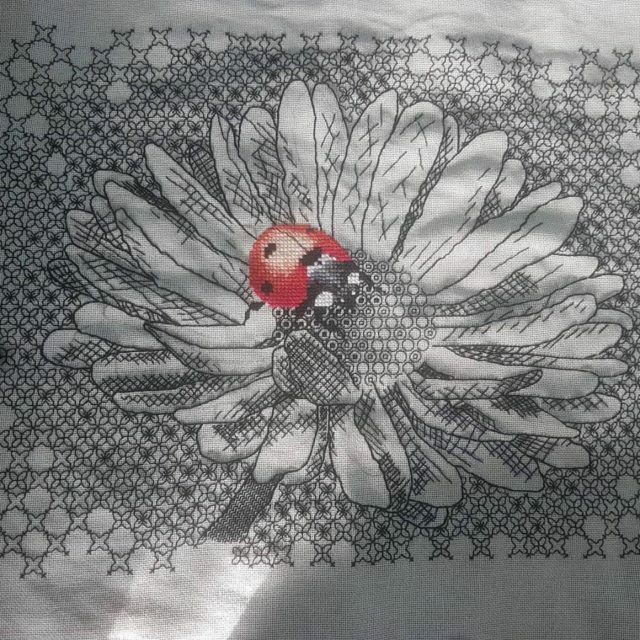 Monday evening we continued with Embroidery Monday and Katherine finished her Blackwork piece which is stunning. Tuesday and Wednesday was all about getting ready for Open Studios which started this weekend. For Eau Brink that meant two days in Thornham for Textiles in Action. I want to say thank you to everybody who stopped by and said hello. Also to everybody involved in the event which made it a great success. Thursday as usual was all about Powertex and for me brooch making. And then off to the school for After School Art club. Where we made Whirly toys from CD’s. Open Studios until the 10th June. Monday its a day of getting to know the studio and having a go. Pop along and for a small fee you can have a go at Printing, Powertex, mixed media, procion dyeing, hand or machine stitch. The kettle will be on and there will be scrummy cake too. Say hello to the sheep, ducks, chickens, and pond life. But most of all to Marlow our dog. During Open Studios we are still running our workshops and in case you need a reminder we have Embroidery Mondays from 7pm till 9.30 pm. Experimental Wednesdays where you can come and have a go at something you have always fancied. Or if your stuck bring your work along and we will see if we can sort it out together. from 10 am till 4 pm. Powertex Thursdays are from 10 am till 4 pm you can make brooches, jars, books and other items. To book just go to www.eaubrinkstudio.co.uk and then go to workshops and click on the dates to see whats happening. When you find something you like click on the Schedule appointment button to book. 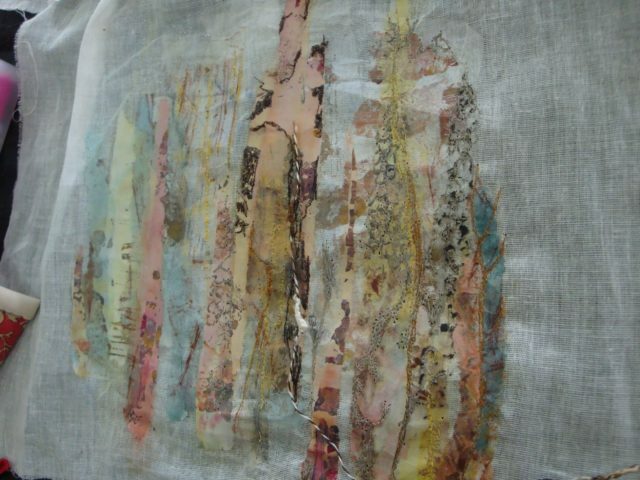 Don’t forget that the Embroiderers Guild will be holding their Time and Tide Exhibition on the 9th and 10th of June. It’s A busy Time for us all at Eau Brink Studio. Why is it so busy you may ask? Well first I am getting ready for Textiles in Action on Saturday 26th and Sunday 27th of May. A Great Exhibition which kicks off the Open Studios this year for me. The Norfolk and Norwich Open Studios runs from the 26th May to the 10th June and you can get your booklets from may places but if you want one and cannot find anywhere near you just drop me a line and I will send it out to you. During this time we have the King’s Lynn Embroiderers guild Time and Tide Exhibition on the 9th and 10th of June at south Wootton Village hall PE30 3LJ. Just opposite the church. Another great Exhibition to visit. Whats happening with Eau Brink studio then? Well at long last due to the nice weather I now have my shed up so can clear out all the items we do not use all of the time and make the studio less cluttered. Thank you boys for getting that done. I am still running our regular workshops during Open Studios. Which are Embroidery Monday from 19.00 till 21.30. Experimental Wednesday from 10 till 4 and Powertex Thursday from 10 till 2. I am also running a taster day on Monday 28th May where you can drop in to have a go at something for just £5.00 per hour. Great if you always wanted to have a go at something but did not want to buy all the equipment in case you did not like it. I will be offering Screen printing, dyeing with Procion or natural dyes, Paper layers, Xpandaprint, and many more mixed media techniques. You can even come and have a go at free motion machine embroidery using my lovely old Bernina. And lastly you can also try your hand at Powertex and make a brooch. During the Open Studios of course there will still be plenty of cake. So if you just fancy popping by to say hello and enjoy a brew you will be very welcome. Is there a downside to this week? Yes there is. I have lost my diary. It is A4 and has my whole year planned into it. It is a Ultimate Diary Planner and I cannot for the life of me find it. I have retraced my movements to the beginning of last week when I know I had it last but it still is missing. I have asked everyone I can think of to look in their bags in case they picked it up by accident and emailed or called everywhere I have been to see if I have left it behind. It is incredible how lost I feel without it. Still I am sure it will turn up and I hope that I do not miss attending anywhere or forget who is visiting the studio over the next week. What an Amazing Weekend we have had at the Kirsite Allsopp The Handmade Fair. 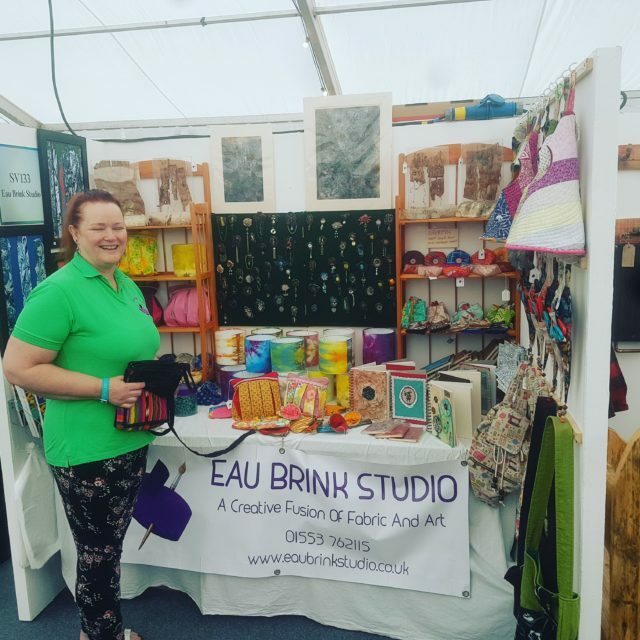 For the past three days we have been at Ragley Hall and the Handmade Fair talking to thousands of lovely people about Eau Brink Studio. Setting up took place on Thursday afternoon and evening so that on Friday by 9am we were all ready to go. Kirstie was around before the show opened and spoke to many of us about our businesses. Then she opened the fair at 9.30. Bright and ready to trade on day two. The days were long but so much fun. I made many new friends with the other traders. The atmosphere was lovely and the organisers could not be more helpful. But the most important people were the many customers I met. We had many laughs and discussions all about crafting. I want to thank each and everyone of you who visited my stall and particularly those of you who entered the competition. The WINNER is LISA KNOWLES who managed to get the nearest guess of how many beads in the jar. the actual number is 1085 and Lisa guessed 1050. Congratulations I will be emailing you your £30.00 voucher. I also want to thank you all for the lovely comments on the quality of my work. I hope to see you again at future shows. The saddest part was the taking it all down and saying goodbye. At The end this was all that was left in the stall as I left to go home. I am really looking forward to going to Hampton Court Palace in September. It all started on Monday with an email from the team at The Handmade Fair which is next weekend. Many emails and phone calls later I think I am ready. I had originally planned to travel on the Friday morning and set up on arrival. But the email I received instructed me I had to be there on the Thursday evening. Panic then. Luckily I could add a night to the hotel but it means I have lost a days preparation. So I cancelled everything else except the experimental Wednesday and the after school art club. Which means I have been using the time to catch up. I am now at the stage of making sure I have everything and will be planning on Monday our staging. Whew. Experimental Wednesday was great fun with us all working on something different. One person using the Lamination technique for transferring pictures to fabric. She then had a go at Shibori dying fabrics too. Another got to grips with free motion machine embroidery for the first time. whilst another lady practiced her free motion machining too. That just left one other who was working on a piece for the Kings Lynn Embroiderers Guild exhibition and I worked on finishing making up peg bags whilst helping the others when they needed me. John popped in to do the PAT testing for those who bought items. Well that’s what he said as we were having tea and cake. The children at the school enjoyed an hour of playing with Xpandaprint by using it with paints on door hangers. They were fascinated when it puffed up. 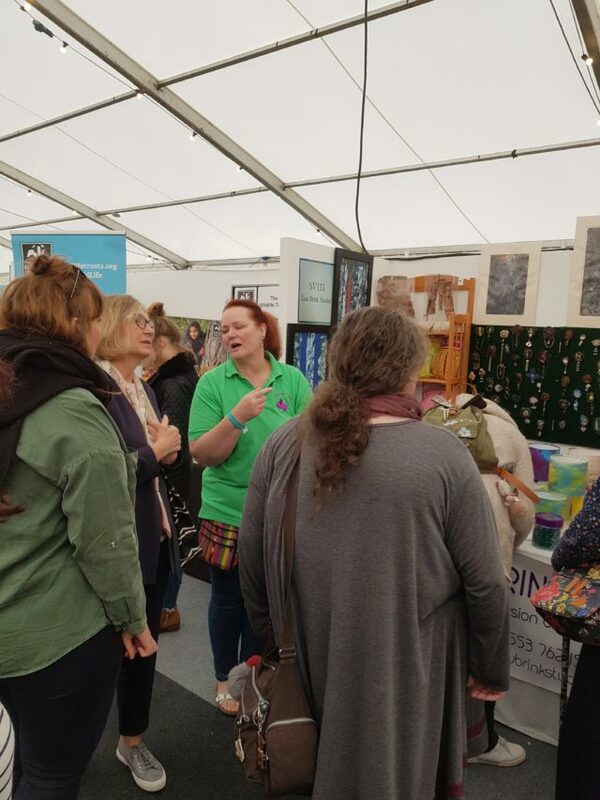 Well beside the Kirstie Allsopp Handmade Fair on the 11th to the 13 at Ragley Hall it is also Textiles In Action at Thornham on Saturday 26th and Sunday 27 which is the first weekend of the Open Studios. Open Studios is from the 26th May to the 10th June. there are lots of artists participating and if you need a booklet they are everywhere. If anywhere has run out just let me know. I have plenty more to give out. The Kings Lynn Embroiderers Guild are holding an Exhibition called Time and Tide on the 9th and 10th June. So there is loads going on for you to go and look at.